North America’s premier East Coast beach holiday destination. Just a three-and-a-half hour drive from Washington, D.C., Virginia Beach offers visitors miles of pristine shoreline, a famous boardwalk, lush wildlife trails and waterways to explore. Relaxation is easy to find in a wide range of accommodation offering comfort and value, and there’s no end to the many activities you can enjoy here. Virginia Beach is served by Norfolk International Airport, just 20 minutes from the resort area, offering direct flights to Washington, D.C, New York, Atlanta, Orlando, Charlotte, Philadelphia and more. An airport shuttle offers transport to the oceanfront and hire cars are available. There are a variety of routes into Virginia Beach. Interstate 64 and U.S. Highways 460 and 58 lead to the area, each connecting with Interstate 95 for access from other east coast destinations. From the north, travelling along U.S. 13 through Virginia’s Eastern Shore and across the world-famous Chesapeake Bay Bridge-Tunnel is a favourite scenic route. When travelling from central Virginia, Interstate 664 through the Monitor Merrimac Memorial Bridge Tunnel is recommended for efficiency. Driving Distances: Atlanta, Baltimore, Boston, Philadelphia, New York City, Washington DC. 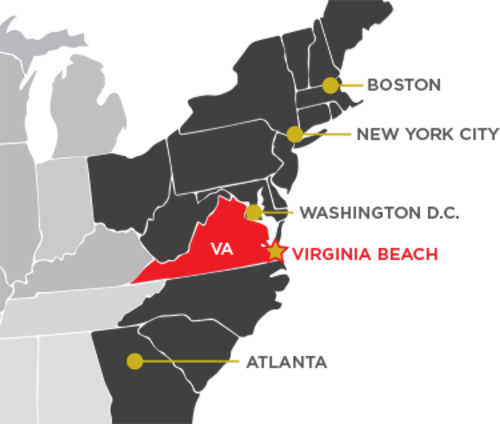 Amtrak services are available to Virginia Beach from Washington, D.C., New York and other east coast cities. Bus services are also available from Greyhound and independent companies. The Virginia Beach Visitor Information Center is open daily from 9am-5pm, with the exception of autumn and winter holidays, to provide information and literature about attractions, special events, dining and accommodation. The Information Center is located at 2100 Parks Avenue, with seasonal kiosks located in the resort area at 17th Street and the boardwalk, and 24th Street and Atlantic Avenue. Electricity supply is 110V, but an adaptor may be used to convert for 220V appliances. Centrally located on the U.S. East Coast, Virginia Beach is in the south-eastern corner of Virginia. The popular resort city is just three-and-a-half hours south of Washington, D.C., and within a short driving distance of many eastern, southern and central U.S. cities. Nearly one-third of the U.S. population can reach Virginia Beach in less than a day’s drive.